The last thing you expect to discover at your Mum's birthday party is a fabulous jewellery designer. I did just that this weekend when Mum received an incredible pair of Simona Chytil earrings. Simona is a Goldsmith, based in Noosa, Queensland, who creates beautiful modern jewellery. 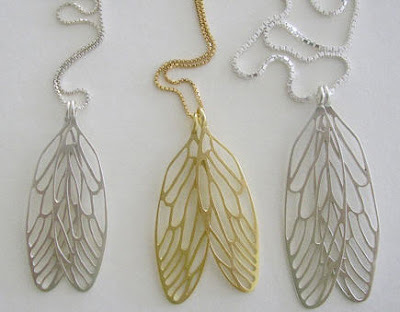 I adore the Cicada range, inspired by a real cicada's wings. The Braille collection is also irresistible, featuring raised bumps. I'd love the silver Braille "Wild Child" ring. Simona splits her time creating pieces for private commissions, exhibiting, and developing her own range of jewellery. Organic forms and nature feature prominently in her collections, with names like Wild, Bloom and Pod. You can find Simona Chytil jewellery at very cool stockists Yoshi Jones and Funkis Swedish Forms in Sydney, and the National Gallery of Australia in Canberra. Also like the non-fiction t-shirt below. Would be great for my husband. Thanks ButtonsByLouLou. I love the wind turbine shirt for guys too. I think it was a pretty popular Christmas gift, as lots of readers have purchased it!